Decay Engine++ with even more features! 1. The graphical output now contains a crosshair cursor and table. This cursor can be moved using the mouse and leads to an easier reading of the values on the curves. For any given time value, the crosshair table below the graph lists the exact values for all nuclides shown on the graph. Both the crosshair cursor and the crosshair table can be switched on and off in the graph settings. 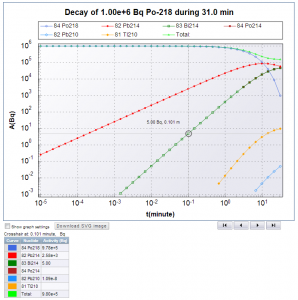 2 The integrated gamma dose is now available for the decay calculation. Previously, only the gamma dose rate was calculated. The integrated gamma dose is of interest in the field of nuclear medicine. The gamma dose rate and the gamma dose are both activated in the Options tab. Thereafter the results are available in the output grid and in the graph. The colour of the “Gamma dose” column in the grid is now the same as for the “Gamma Dose rate” column and both come under the Options classification “Handling”. 3 In the previous release of the Decay Engine++, the activity ratios were calculated and shown in the output grid for the final timestep in the calculation. These activity ratios are now available for all calculated times in the graph. Clicking on any (nuclide) activity ratio in the column “activity ratio” will normalise all nuclide activities this nuclide activity. As announced in the recent Nucleonica Newsletter, we are currently upgrading most of the applications with a view to improving user-friendliness and calculation / response times. This means in practice fewer calls to the webserver and more emphasis on local client side computing. The first module incorporating these new features is the Decay Engine++ which we have now released for our Premium users. The name has been changed to Decay Engine++ to distinguish it from the previous version (which we will continue to support for a few months). 1. A new highly efficient algorithm is used in the Decay Engine++. Details of the algorithm have recently been published in Annals of Nuclear Energy. 4. A new Options tab has been developed for selecting the mode of operation and the quantities to be shown in the output datagrid. The Options are now colour coded according to the type of data (general quantities, handling, disintegrations) for ease of selection of the appropriate quantities. 5. 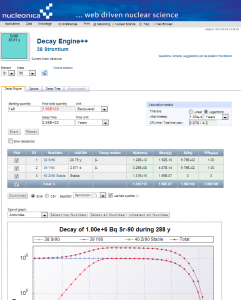 A new Decay “Tree” tab has been developed which shows a decay tree of the decay processes (number of nodes, nuclides, and linear chains, etc.). 6. The output activities can now be normalised to the parent or any of the daughters. This is of interest, for example, in nuclear forensics where the “age” of a material depends on these dimensionless ratios. 7. The Decay Engine++ has been tested successfully with Firefox, Chrome, and Safari browsers. It runs also on the Internet Explorer (IE) but only on version 9 and above (it does not run on IE8 – no support for SVG).